As homeowners, it is vital we maintain and repair our homes to ensure the structure will endure. Likewise, communities must be diligent about maintaining infrastructure because neglecting it will lead to costly and inconvenient repairs. 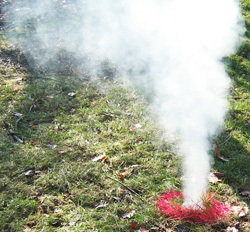 Smoke testing is one of the best methods used to maintain a healthy sanitary sewer system. It should be completed during the warmest and driest time of the year when the groundwater is at its lowest and storm inlets are dry. To identify leaks in your sanitary sewer system, non-toxic smoke is blown through isolated pipe segments to observe both private and public property defects (i.e. pipe fractures and offset joints, connected downspouts, defective cleanouts, and storm inlets). Pressurized smoke will fill both the main and service lateral connections. Wherever smoke can get out, water can get in. Plugs can be used to isolate particular pipe segments and increase smoke pressure, maximizing defect identification. Prior to smoke testing, we recommend you acquire system mapping, if available. Check your equipment’s oil levels, leaks in hoses, test plugs for leakage, and ensure air tank is working properly. Communication is important when smoke testing in residential areas to put homeowners at ease. Notify them 24 to 48 hours in advance through the distribution of flyers and door hangers. These notifications typically contain FAQs and instructions for the residents, which include pouring at least one gallon of water into unused drains to prevent smoke from entering the property. Inform local police and fire departments about the smoke testing to avoid unnecessary calls. Public coordination is crucial. Smoke testing sanitary sewers is one of the most cost-effective tools for locating unwanted sources of I/I and should be performed prior to moving forward with more expensive collection system evaluation techniques such as sanitary sewer cleaning and televising.